No, I'm not making pirate noises but I'm talking about the Great Aloha Run... or Jog... or Walk... or Crawl - an 8.15 mile race from Aloha Tower to Aloha Stadium. Where else would you be surrounded by nearly 30,000 young, old, fit, athletic, overweight, weekend warrior types with one goal in mind: crossing the finish line.... without passing out. Never mind that it's a charitable organization that gives more than $400,000 to the community annually and provides volunteer and community service opportunities. 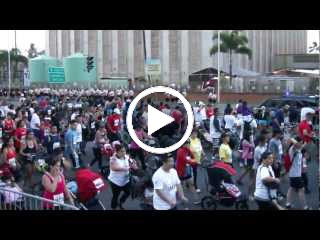 Never mind that in the past twenty-seven years the Great Aloha Run has raised over $9.1 million for 150+ non-profit health, human service organizations and community groups throughout Hawaii. It's all about the pain. I've run the GAR four times since 2000 but since working at The Advertiser, I was unable to participate because it wasn't an observed holiday. Now that I have the holiday back, it was something I thought I'd try again. Da Wife was relunctant at first till the last day of the early bird entry but she decided to try it out since she's never done it before. I gave her the lowdown about what to expect: casualties, man-e-faces and false cracks. Casualties. There would be many but I didn't expect to see one within the first two hundred yards. There was a high schoolish looking girl slumped over her knees crying and obvious she wasn't going to be able to continue the race. It looked like a sprained ankle but I'm just guessing. There are always a few along the way as well and I saw two people hurling on the side and another looking like they needed oxygen pronto. Man-e-faces. It starts the moment you wake up. There's the voice in your head is asking why the heck are you up so early on a holiday? Then in darkness, battling rush hour traffic but at 5 in the morning, finding parking, boarding a bus to shuttle you to the start line, battling the morning chill, waiting forever for the race to start, stretching in solitude, listening to the national anthem, the Sounds of Freedom groups cadence, cheering, hollering and the race hasn't even started yet. The roller coaster ride has only just begun as those who started off with gusto and a smile end up looking like.... well, let's just say it ain't pretty. False Cracks. There are three major false cracks. The first is right at the start of the race when you hear the gun. You typically associate the sound of the gun as the start of the race but unless you're an elite runner at the head of the pack, you typically won't even be able to start going give or take anywhere from 10-30 minutes later. We "officially" started 22 minutes later. The second false crack comes at the Nimitz overpass. You've driven or ridden the overpass or underpass before and what feels like thirty seconds to get from the beginning to end is pretty quick buuuut when you're walking or running it, it literally feels endless. The last false crack - which is probably the worst - is entering the stadium grounds and "thinking" you just about finished and find out that you still have to go half way around the stadium, down the long tunnel and once you cross the finish line you still have to go literally around the same half just to get outside, then walk up a steep grade hill to pick your refreshments and shirt. And the kicker? If you parked far, you still gotta get to your car! I swear we walked another two miles AFTER the finish line. Since we met up with my friend and his ohana, we were at da end of da pack. It may not seem crowded but once the gun sounded, we were shoulder to shoulder inching our way to the official start line. Click the picture for a quick look as some of the Sounds of Freedom groups get started. We found out moments latah why a couple of solo bikes went wisking by. It was to aid da girl with wat appeared to be a sprained ankle. Even with cones and barricades lining the course, people still ignored the safety measures as 18-wheelers roared by a few feet from their elbows. I couldn't believe some parents did that with their strollers and babies in tow - Wassup Wit Dat! Let da "can't see da light at da end of da tunnel false crack" begin. Going to da lua is a sure-fire time killah. Minimum 15 minutes added to your race time. It's been a long while since I've ran da race but I was surprised to see such little rubbish as the road used to be flooded with empty cups. Da Wife made me throw da cup away to a volunteer holding a garbage bag. Do you see something wrong in dis picture? Da taiko's were so cool listening to as we jogged through - Awesome beat and motivating. There were a few oddah bands that were placed along the route and imho, there could have been more. It's amazing what a little music can do for you. Da first glimpse at da prize. Wassup Wit Dat! ............. need I say more? THEY LIE!!!! There was no Michelob Ultra to hydrate with right there! How you going tease a braddah li'dat aftah six miles! Wassup Wit Dat! We finished at a time of 2 hours and 20 minutes which is pretty good considering we didn't train one bit and would have been a little faster had I not been taking pictures and a pee break. I told Da Wife next time we bettah at least beat my slowest time of 1 hour 45 minutes since wen I did do dat run, it was practically on one leg being I was only 1 1/2 months out of ACL surgery. Congrats to you and your wifey! Thanks for the pictures! Wow, that's good time! Great post, BL. Da guy with da horns, he Cow Man. My neighbor who ran every GAR said Cow Man is da same. Flies in from BI every year. Did da GAR too, maybe 5th one but started late in life, first when was 57 I think. Been running regularly for about 10 years now but GAR's 8.15 mile is da longest I will run, prefer da shorter 5k and 10k road races. Next time, going warm up properly, then force my way to beginning of the white numbers just before da start, which means climbing ovah da barrier fence. I was there 40 minutes early about 50 yds from da start, standing shoulder-to-shoulder so cannot stretch and warm up. Da gun sounded, took off, and body didn't feel right, legs were stiff and hard to get a good rhythm. As usual, started off too fast, the last 2 miles were tough, losing form, arms flailing at the finish. I should be listening to my son, who ran cross country in college and is a big advocate of negative splits...starting easy to warm up and finishing stronger and faster. Every year we organize a President's 100 club team so can get extra goodie bag, post race pizza lunch and special prize drawing. I print a special t-shirt for our group. Next year BL and anyone else like join our group? Let me know. Ooh, I like join the team @hemajang. Supposedly me and a co-worker gonna take off work and attempt our first GAR. We'll see. Thanks for the recap and pictures. congrats to you and wife. too good you guys! I could paddle it if it was in the ocean. hee hee I bet you going tell me I stay blind li'dat. Lurve seeing all your pics. My nephew did da walk. their goal was 3 hours. They made it in 2:59:11. They had to run the last section to make it under 3. I get crazy family. Just like me. It's been many moons since I did one of these. More for Da Wife... I knew she could do it but it was a mattah if she knew she could do it. Some characters you see along the way. Wassap with dat guy carrying his ruck pack. Da Wife said he must have lost a bet. I was a little bewildered as to why he do dat knowing - just by his ruck pack - he represented da military? There were oddah soldiers in camo gear doing da "run" and hea's a guy in a French speedo. Dunno, if I was in da military I'd be offended but I'm not so I just gotta shrug my shoulders and say WWD!. Eh wait? Das wifey? First time you post one picture from the front angle. Da Wife look-a-like. I just wen grab da closest wahine and asked if they like take picture. It was good but a beer would have been bettah. I thought he was familiar. I seen him before. It's a pretty good test of da average person's endurance. It's just long enough to see if you can make it. I was there 40 minutes early about 50 yds from da start, standing shoulder-to-shoulder so cannot stretch and warm up. Yeah, it's very crowded and you cannot do nothing unless you're on da sides cause you get a little more room. I usually stretch out in da side street before making my way ovah and then do da shmall kine loosey stuff wen waiting. As usual, started off too fast, the last 2 miles were tough, losing form, arms flailing at the finish. My organization does da same - das kinda why I decided to start up again. They wen make some pretty good stuff and got anoddah free shirt, energy drink and stuff. Next year I go ask everybody and maybe make one WWD! shirt yeah? I tink EVERYBODY has to have gone through dat. You know wat? A lot of people do push cause it's so close and they want to at least say they ran at da end. Yeah, early bird. Das da way to go... plus get free shirt. I chickened out this year. I will make it one of my goals for next year. Hey BL, I may attempt it... if I can rent one motorized wheelchair! Ha ha ha! At least they made their time. Good they wen make 'em cause would have been sick if they wen miss 'em by a few seconds. I'll keep you company, ankles. Sooo, da wife did the GAR with you. Did da Baby take the car and meet you guys at the finish line? looks like y'all had a great time! and, you didn't post a bad time either! next year, i have to get back to it... only thing is, hubby and son now want to run the GAR... but I just want to walk!! hopefully, i don't end up walking by myself!